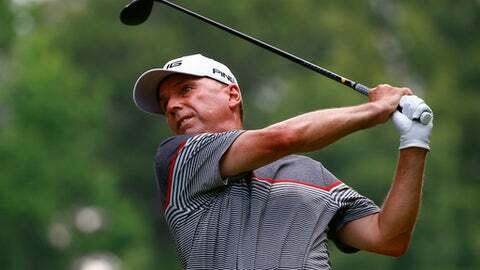 BENTON HARBOR, Mich. (AP) Kevin Sutherland and Scott McCarron have been rivals since their junior golf days around Sacramento, California. The two old friends were back at it Friday at the top of the Senior PGA Championship leaderboard. ”It’s honestly, nothing new for us,” said Sutherland who played in the third-to-last group and birdied his last two holes for a 5-under 66 to match McCarron at 8 under. McCarron had a 68 in the morning wave to emerge from a championship record group of six tied for the first-round lead. Sutherland was last year’s Charles Schwab Cup winner with his only senior win coming in the season-ending Charles Schwab Cup Championship, while McCarron has six PGA Tour Champions wins, including a major at the 2017 Senior Players Championship. Sutherland’s lone PGA Tour victory came at McCarron’s expense in 2002 at La Costa in the Accenture Match Play Championship, when he beat McCarron 1 up in the 36-hole final. As youngsters they played on opposing high school teams located about an hour apart and met often in state tournaments as well as on the California junior circuit. Jerry Kelly shot a 65 to join Tim Petrovic (69), Chris Williams (68) and Joe Durant (67) at 7 under. Durant tied for second last week in the Regions Tradition, also a major championship. McCarron feels like he is just starting to warm to the task this year. He had to replace his clubs, including a favored putter damaged beyond repair in air transit two months ago. McCarron said the Harbor Shores course played a little tougher in light winds in the second round. He made six birdies and three bogeys. McCarron came to the press center after his round and walked in on a press conference where course-designer Jack and Barbara Nicklaus were being honored by sponsoring KitchenAid with the establishment of a local college scholarship program in their name. McCarron, who said he has idolized Nicklaus since his youth, played media and asked Nicklaus what he ate when he was near the lead going into the weekend of a major championship. Nicklaus said if you play well one day, eat the same thing the next day. ”But no hamburgers, or you will play like hamburger,” he said. Stuart Smith, the Reno, Neveda, club pro who was tied for the lead after the first round, missed the 36-hole cut with a second-round 83.